What is with this heat wave we are having in the Northeast? It's a bit too early for it in my opinion, but we still need to eat so I planned a delicious day of hot weather eating this weekend. My salsa is extremely refreshing - something about cilantro and cold tomatoes. Yum! I made a huge bowl of it for afternoon snacking. My salsa is very simple - just chopped tomatoes (no seeds or juice), chopped onions, chopped jalapenos (with or without seeds), chopped fresh cilantro and salt. 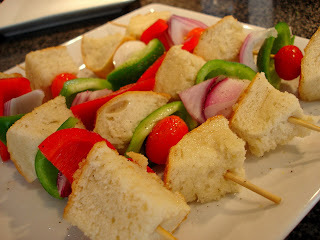 Assemble skewers in an order where you'll have a piece of bread on each end, and one in the middle. I also go for color when assembling. Brush each skewer on all sides with olive oil; sprinkle with salt and pepper. Grill on a medium-high grill for 3 minutes on each side. 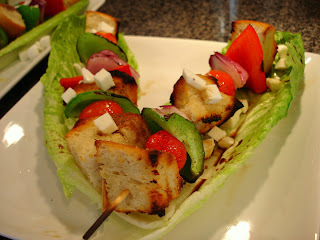 Place each skewer on a romaine leaf and drizzle with olive oil and balsamic vinegar. Top with some of the mozzarella. These skewers were so delicious and different! 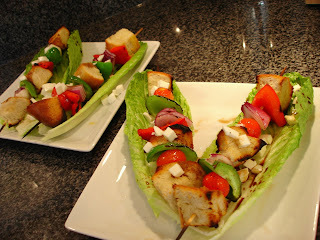 We both loved the contrast between the hot, grilled bread and veggies and the crisp, cold Romaine lettuce. I think the balsamic vinegar and oil made the perfect dressing. The original recipe called for basil pesto, but we both aren't fans of it and I think it would have been too much and may have taken away from the simple grilled flavor of the bread and veggies. I can't wait to make these for company. Enjoy and stay cool!